CBS reportedly wants Tony Romo too; what if he doesn't want to leave the NFL, though? CBS reportedly wants Tony Romo too; what if he doesn’t want to leave the NFL, though? Fox isn't the only network reportedly targeting Tony Romo. At CBS, it’s unclear where Romo would land on the pecking order. In 2016, the No. 1 team at CBS was Jim Nantz and Phil Simms, following by Ian Eagle and Dan Fouts, Greg Gumbel and Trent Green, Kevin Harlan and Rich Gannon, Spero Dedes and Solomon Wilcots, Andrew Catalon and Steve Tasker/Steve Beuerlein, Tom McCarthy and Adam Archuleta, and Carter Blackburn and Chris Simms. Romo could supplant an analyst, or potentially slide into a spot and bump everyone else down a peg. The answer also depends on whether Romo is willing to conclusively slam the door on football. In theory, he could take a TV job and keep an eye on potential football opportunities for a mid-to-late-season jump back to the game. CBS likely wouldn’t install him as the No. 1 analyst unless he’s fully committed to the TV gig. This has happened before, with Brady Quinn taking a Fox job in August 2014, then changing his mind a few days later and signing with the Miami Dolphins (he was cut later that month). It also happened with Tim Tebow, who started working for the SEC Network in December 2013, then tried a NFL comeback in 2015 (he was cut by the Philadelphia Eagles after training camp), then returned to broadcasting before trying a baseball career in 2016. Interestingly, Tebow’s contract specifically let him keep pursuing sports opportunities. Could Romo wind up with something like that? That might be possible, but it all depends on where Romo lands. If he’s in one of the lower-down teams for CBS or Fox, they might be willing to let him walk mid-year if an enticing opportunity to play becomes available. If he’s on one of the top teams or in a regular studio role, though, that becomes much tougher; mid-year changes in high-profile positions aren’t easy. Moreover, this is all somewhat jumping the gun and assuming that Romo is ready to leave football. 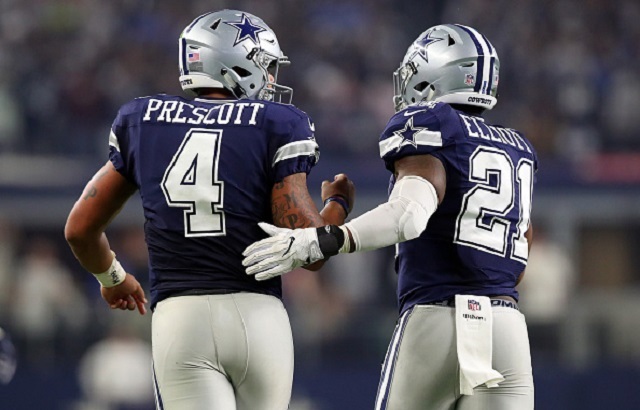 There’s reportedly significant interest in him from other teams if the Cowboys decide to release him or trade him, so his NFL career may not be done yet. (It’s also possible Dallas keeps him around as a backup if they don’t get an offer they like, although that doesn’t seem all that probable.) Romo has played at a high level relatively recently, and while he turns 37 in April and has had numerous injuries, there are plenty of teams in need of quarterback help who might see him as a desirable addition. If Romo does decide he’s done with football (permanently or for a least a while), it’s notable that there are at least two networks interested in him. That could lead to a bidding war, or it could lead to him being able to pick whatever network and role seems like the most natural fit. It means there are more broadcasting options for Romo, which is advantageous for him, and that may boost the chances of him leaving the field for the booth. We’ll see where he winds up, but it’s definitely interesting that CBS wants him too.